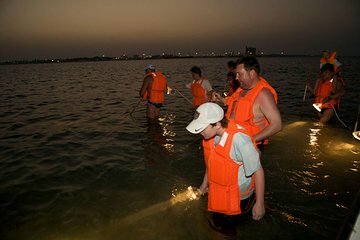 Go hunting for crabs in the mangroves during this 7-hour evening activity in Dubai. With an expert crab fisherman as your guide, set out with a spear and lighting equipment in search of the biggest, juiciest crabs. Learn spearfishing techniques and get as much guidance as you like. Sit down for a buffet dinner, including your fresh catch. Round-trip transportation from Dubai hotels is included. Get convenient hotel pickup in Dubai, then climb aboard a comfortable tour vehicle bound for your hunting destination. Drive for about 1.5 hours, enjoying views of the desert scenery along the way. Upon arrival, fuel up for the hunt with a light snack and refreshments. Get a short orientation to the methods of fishing for crabs with spears from your expert guide. Board a boat for a 30-minute ride into the mangroves and get started. Your guide will assist you in finding crabs and the effective methods for catching them with the spear, as crab fisherman have done in the area for centuries. Enjoy the scenery of the mangroves and the challenging hunting before heading back to the departure point, fresh catch in hand. Sit down for a hearty buffet; the chef will prepare your freshly caught crab as an accompaniment to the other dishes. Your tour ends with drop-off back at your Dubai hotel.